La Presqu'Île luxury camping site is perfectly poised directly adjacent to the sandy stretch at Saint Asile in St Mandrier, on the French Riviera coastline. 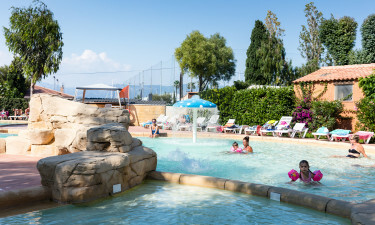 Typical of a cosy, Cote d’Azur holiday resort, it offers a diverse selection of bungalow tent and mobile home accommodations to guests looking forward to a luxurious break away. If it's sun sea and sand you're after, you don't have to look any further. To get your holiday of a lifetime started, call LUX-camp today and we'll set the ball rolling. Welcome to La Presqu'Île Campsite. 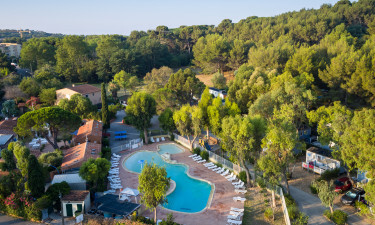 What's unique about La Presqu'Île campsite? Exceptional onsite amenities with ice-cream bar. 400 m to to a lovely sandy beach. Onsite children's club with lots of activities. Close to several towns and villages. If you can drag yourself away from your mobile home or bungalow, you don't have to walk far to top up your tan and get some of that coastal fresh French air. La Presqu'Île campsite is only 400 m away from a lovely stretch of golden beach. Listen to the ocean waves crashing against the shore or go for a dip in a clear blue sea. For something that little bit different, you might like to test your scuba diving ability as the beach organizes sessions. What camping holiday is complete without a planned picnic? If you've access to a motor, this area has a plethora of tourist hotspots with breathtaking views and voluptuous landscapes. If you've got the kids with you, pay a visit to the nearby Aqualand Fréjus. This is the largest water park on the Cote d’Azur and filled with fun water rides and features, sure to keep the family entertained for hours on end. La Presqu'Île campsite is all about luxury camping and that standard extends to the site's amenities and organized activities. Take your pick of table tennis, boules or grab a bike and go exploring the picturesque, unspoiled countryside. There are two heated pools, one for the family, and a smaller pond for kiddies to plash about in. When they tire of the pool complex, there's an onsite children's club loaded with lots more fun-filled activities. 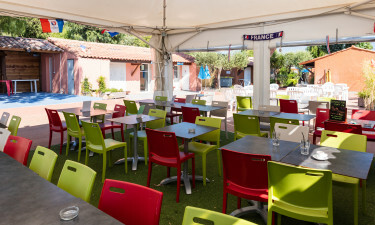 At La Presqu'Île campsite you have everything at your fingertips and that includes food and drink. You'll be spoiled for choice because it has an ice-cream parlour, bakery service, cafeteria, pizzeria, bar plus a full restaurant facility where you can dine indoors or under a blanket of glistening French stars. La Presqu'Île Campsite has a small mini-market for your convenience. Imagine waking up to a clear blue sky and heading to the bakery to pick up some gorgeous French bread and croissants for breakfast by the pool. The surrounding towns and villages provide plenty more shopping opportunities, with their vibrant and lively bars, bistros and restaurants all serving delicious French delicacies.